Un nuevo estudio sobre cuatro especies de reptiles voladores, cuyas conclusiones adelanta National Geographic, estos animales de hace unos 70 millones de años tienen el record de vuelos de larga distancia en toda la historia y prehistoria. Estos reptiles eran tan altos como una jirafa, tenían una envergadura de diez metros y tenían una resistencia tan increíble que podía recorrer 16.000 kilómetros sin pisar tierra, utilizando su grasa corporal como combustible para el viaje. El investigador Michael Habib, especialista en Biomecánica de la Universidad Chatham, en Pittsburgh, ha analizado la envergadura y la masa corporal de estos animales para calcular cuál podía ser la resistencia de vuelo y cree que consistía en unos minutos de batir de alas, seguidos de largos periodos de «vuelo sin motor» gracias a la ayuda de las corrientes de aire. La investigación contradice estudios anteriores que señalaban que animales tan pesados eran incapaces de despegar y sólo podrían lanzarse al aire desde lugares elevados. Habib, M. 2010. 10,000 miles: maximum range and soaring efficiency of azhdarchid pterosaurs. In: Program and Abstracts. Seventieth Anniversary Meeting Society of Vertebrate Paleontology. David L. Lawrence Convention Center, East Lobby & Westin Convention Center Pittsburgh. Pittsburgh, PA, USA. October 10-13, 2010, 99A-100A. Azhdarchid pterosaurs include the largest known flying animals, with the largest species reaching a potential mass of over 250 kg. Prior work suggests that several features of azhdarchid anatomy could be associated with a soaring-dominated lifestyle, including large size, burst-flapping adapted pectoral girdle and proximal forelimb, moderate to high wing aspect ratio, and exceptional pneumaticity. However, long-range flight ability of azhdarchid pterosaurs has not been quantified in the literature. I present the results from a quantitative analysis of long-distance travel efficiency in azhdarchid pterosaurs. 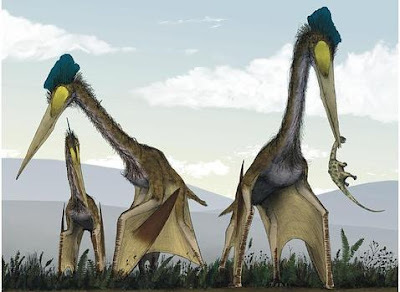 Power analysis indicates that the largest pterosaurs needed to reach external sources of lift, following launch, before they exhausted anaerobic muscle endurance. The efficiency of the initial climb out from launch would have impacted required proximity to lift sources. Approximately 2.5 chord lengths are usually required before a wing develops full steady state circulation (known in the literature as the “Wagner Effect”). Analysis of the tensile support in azdarchid wings suggests a potential for rapid translation and twisting of the outboard wing, which would be promoted by the T-shaped cross section of the wing phalanges. Such rapid translation can develop full circulation up to five times faster than otherwise possible and greatly reduce the flapping cycles needed to reach maximum circulation during climb out. Following climb out, even large azhdarchids should have been capable of staying aloft by using external sources of lift. A quantitative framework already exists for estimating maximum migration range in soaring birds using thermal lift. I have extended this framework to pterosaurs by altering existing models to accommodate the membrane wings of pterosaurs and uncertainty in potential muscle physiologies. Maximum fuel capacity (stored as fat and additional muscle) was estimated by taking the difference between body masses scaled from skeletal strength (maximum) versus mass for maximum wing efficiency. This new migration model indicates that the largest azhdarchid pterosaurs had the capacity for non-stop flights exceeding 10,000 miles.